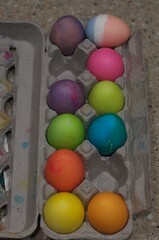 I think it's an obligation to put an egg in every dye available, and make sure it turns into some sort of putrid color. I was pleased to see that today's version leaned more in the direction of purplish-slate, as opposed to poo-brown, like it usually does. The girls had a good time. Becky ate ”jaibeens“ while the rest of us went nuts with the dye. She likes jellybeans. A lot. I wish we had twice as many eggs to dye, since I have trouble sharing with others. I'm looking forward to deviled eggs, or egg salad, or both. Happy Easter.